104750 Bright White Removable Satin Gloss 8 pt. 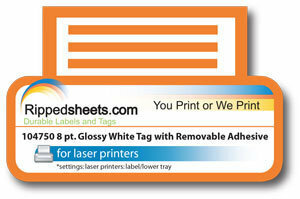 Tag is a perfect solution for applications where a tag with removable adhesive is desired. This 80# tag has a substantial feeling, especially when custom diecut to your design and doubled over to make a header card or carton sleeve (e.g. wrapped around a package and printed with content information for prepared food and other products). This material runs successfully through both color and black & white desktop size laser printers with Heavy Paper settings.